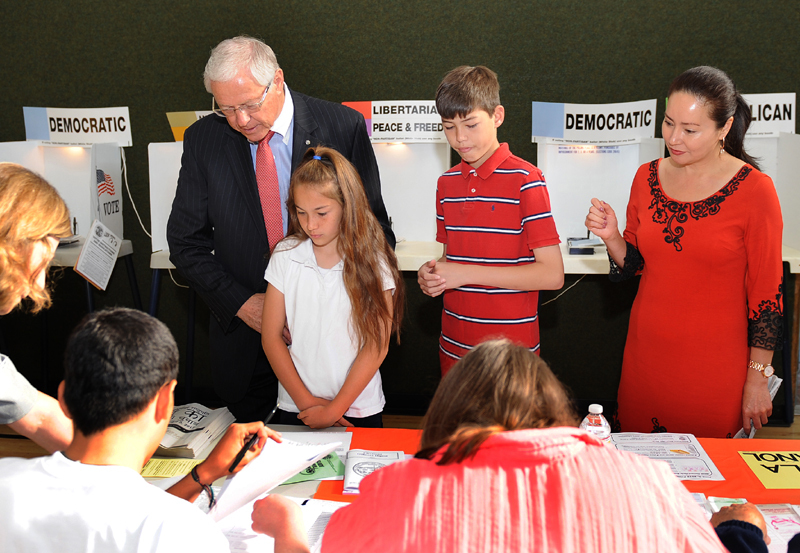 Antonovich family at their Glendale polling place, 6-5-2012 (from left): Supervisor Michael D. Antonovich, daughter Mary Christine, son Michael Jr., wife Christine. The only supervisor 5th District voters have known since 1980 when he rode on the coat tails of Ronald Reagan’s first successful presidential campaign to defeat incumbent Supervisor Baxter Ward, former Assemblyman Antonovich, R-Glendale, will be starting his final term as dean of the Board of Supervisors. That’s because county voters passed Measure B by a 63-37 margin in 2002, limiting supervisors to three consecutive four-year terms. Measure B wasn’t retroactive, so Antonovich’s first six terms didn’t count against him. The clock started ticking with his 2004 reelection. He won’t be the first to go. That distinction falls to current board Chairman Zev Yaroslavsky and 1st District Supervisor Gloria Molina, who won their final terms two years ago and depart in 2014. Antonovich and 4th District Supervisor Don Knabe will be termed out in 2016. Only Mark Ridley-Thomas will outlast them if he’s reelected. A former state senator, Ridley-Thomas won his first term on the board in 2008. It was the first change in the board’s makeup in 12 years. While the faces on the board have remained the same, change has happened all around them. Locally, the city of Santa Clarita sprouted up on Antonovich’s watch in 1987, and the portions of the Santa Clarita Valley that remained unincorporated were newly empowered through town councils Antonovich appointed to keep him informed of the community’s needs as the county – particularly the north county – grew. The county’s population numbered just 7.5 million in 1980 when Antonovich was first elected. Today the figure is 10 million. Thus, as one of five supervisors elected by district, Antonovich directly represents 2 million people in the Santa Clarita, Antelope, San Gabriel, Pomona and San Fernando valleys – more than the entire population of 14 states of the Union. “I deeply appreciate the vote of confidence and the opportunity to continue representing the over two million residents on the Board of Supervisors,” he said in a statement. ” Over the past eight terms, my office has empowered our unincorporated communities with a voice and supported public safety, foster youth and municipal services. “To achieve our goals, we had good teamwork with our communities and my staff to rebuild Olive View Hospital after the Sylmar earthquake, build the Antelope Valley Courthouse, create the Los Angeles County High School of the Arts and remove guns from convicted felons through our DISARM program. In addition, by consolidating County departments, the Quality and Productivity Commission I initiated has saved taxpayers over $4 billion. “To protect life and property, we enhanced the Fire Department’s air support and will continue to construct new fire stations. Initiating the restaurant and nursing home grading systems protects public health and enhances quality care. To expand recreational opportunities for equestrians and hikers, we increased open space, parks, and trails.